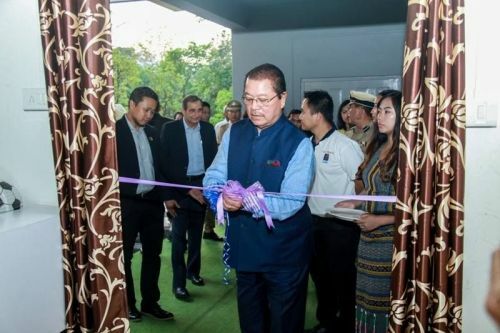 The Tata Trusts Centre of Excellence for Football (CoE) was launched in Aizawl by Mr. Lal Thanhawla, Hon'ble Chief Minister of Mizoram here on Friday. The institution located at Mualpui, Aizawl was established by the Tata Trusts in collaboration with the Government of Mizoram, Mizoram Football Association, Mizoram Police and Aizawl Diocesan Education Society (ADES). It aims to provide world-class training and development opportunities for young footballers from the North East. "I am happy that the state is progressing in football," said Mr. Lal Thanhawla. Tata Trusts CFO & Secretary Burzis S. Taraporevala, ADES Secretary Fr. Santiago Savari, Tata Trusts Zonal Head Biswanath Sinha, MFA President Lal Thanzara, and Mizoram DGP Balaji Srivastava also addressed the gathering. India international Jeje Lalpekhlua, Lalruatthara, Jerry Lalrinzuala, the legendary Shylo Malsawmtluanga and NorthEast United defender Robert Lalthlamuana, were also present at the launching ceremony. At present, the Tata Trusts has selected 25 students, after in-depth scouting across the states of the North-East of which, 16 boys are from Mizoram, four each from Assam and Manipur, and one from Nagaland. The boys are aged between 13-15 years and ADES teachers will provide formal education in the academy itself. The batch comprising of children between 7th to 9th grades, will be homeschooled for five hours daily from Monday to Friday. The CoE is also equipped with a reading room and library.